I’m delighted to share our Skywriters Anthology Call-Out poster with you and to update you on the progress we’re making with some of our Big Skies Collaboration (BSC) projects in the region we call southeastern Australia’s 700 Kilometre Array (700KA) of astronomical observatories. 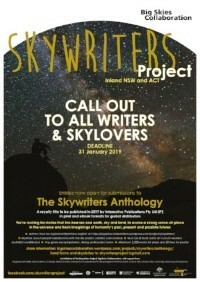 Our Skywriters Project is now seeking submissions for its first Skywriters anthology to be published in 2019 as a royalty title by Interactive Publications P/L. We’re looking for engaging stories, in prose or poetry of any genre, about your own or other people’s (or other entities?) connections with the rest of the universe as experienced, at least partly, from within the fuzzy borders of our 700 KA region. You can find more about registering as a Skywriter, the submission criteria, selection process, our curating editors, and the 31 January 2019 deadline here. Please download our poster, stick it on your walls, share it on social media, submit your own skystory, and/or invite your friends and colleagues to submit their skystories too. A few of our Skywriters have already shared their stories as ‘preprints’ on our website. You can read them here. The Wiradjuri Study Centre, in the remote little town of Condobolin, in Central Western NSW, is hosting its first Condo SkyFest on 9/10 November 2018 as part of our Big Skies Collaboration. This community event will celebrate both 60,000+ years of cultural continuity on the inland plains and the beauty of Condo’s very dark night sky. 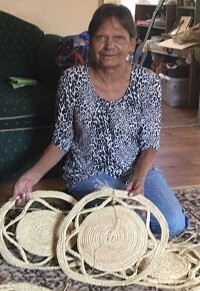 The program will include a guided tour with cultural astronomer and Big Skies Collaborator Trevor Leaman and other astronomers; an exhibition of Scott Towney’s Wiradjuri Skyworld, or Wiradjuri Murriyang; Seven Sistas Weavings, an installation by Big Skies Collaborator Bev Coe (pictured) and the fibre artists of Condo’s SistaShed; Wiradjuri language, didjeridoo, boomerang, kite making, family history and cooking workshops; and lots of activities for budding young astronomers and astrophysicists. Cost: a gold coin donation at the gate. Food provided and everyone will be welcome. Condo SkyFest emerged from our Wiradjuri Skywriters Pilot Project through a grant from the Copyright Agency’s Cultural Fund. The Wiradjuri Study Centre and its project partners, including Lachlan Shire Council, hope to grow SkyFest into a major cultural and astro-tourism event on our Inland Astro-Trail in coming years. Visit our Condo SkyFest webpage or CondoSkyFest on Facebook for updates. Another of our BSC initiatives, the Inland Astro-Trail, will connect astronomical observatories, astro-tourism and heritage sites within our 700 KA region. We’ve received warm support from Destination Country & Outback NSW staff in Dubbo and the Dubbo Business Centre. With their practical encouragement, IAT’s inaugural president, Yvette Aubusson-Foley, is developing a business plan and strategy to engage local government authorities within our region. Given all our other commitments, our progress is slow, however. 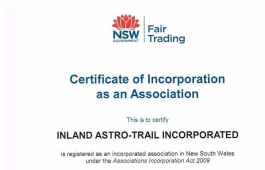 We’d love your support and ideas – so why not contribute to the discussion on our Inland AstroTrail Facebook page (@InlandAstroTrail) or join our closed IAT group and give us a hand. IAT Inc.’s first annual general meeting and symposium will be held early next year. We’ll let you know when and where well in advance. In 2017 a group of creatives led by Big Skies Collaborator David Clarkson, from the Sydney-based Stalker Theatre Company, spent a week as artists-in-residence at beautiful Bundanon workshopping an ambitious concept for a high-tech theatre production. We wanted to tell some of our inland skystories in new and exciting ways for the 50th anniversary of the first moon landing. We developed a great concept! The bigger challenge now, however, is raising funds to transform the ideas into reality! No luck in Australia so, with Australia Council support, David pitched the project to investors in Shanghai, China. And some of them liked what they saw! The negotiations are continuing, but David and his team remain very hopeful that contracts will be signed soon. We all have our fingers crossed! 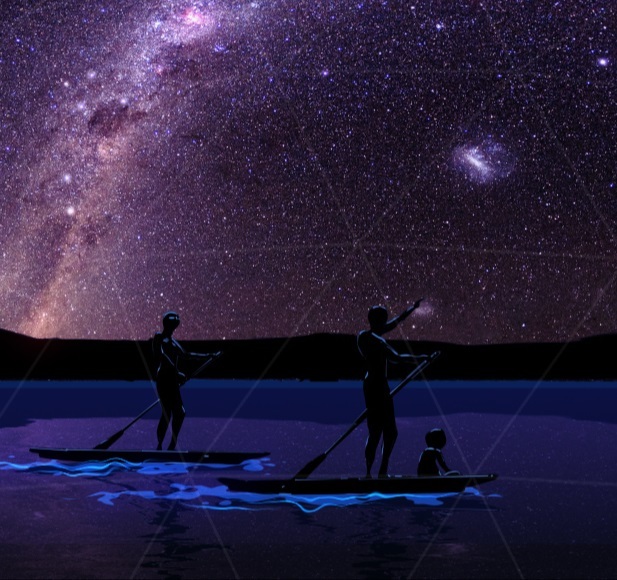 The starry graphic above is part of a draft rendering of the Kalari-Lachlan River and Milky Way (the River in the Sky) by Simon Rippingale for Stalker Theatre’s Big Skies production. 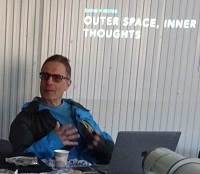 Big Skies Collaborator, David Reiter, travelled our Inland Astro-Trail in July 2018 to research a new interactive project, Outer Space, Inner Thoughts. He met skywriters, astronomers and sky lovers in Armidale, Tamworth, Narrabri, Coonabarabran, Dubbo, Parkes, Condobolin and Bathurst. David’s visit also gave local skywriters an opportunity to discuss their own work at our various gigs. David’s IAT tour was the first of what we hope will be many by visiting creatives. Our thanks to our co-hosts and supporters, including Tamworth Regional Astronomy Club, Narrabri Library, New England Writers Centre, ‘Donna the Astronomer’ at Milroy Observatory, Macquarie Regional Library, Outback Writers Centre, Parkes Library, Wiradjuri Study Centre, Bathurst Regional Library, Orana Arts and Arts OutWest. 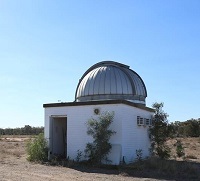 Writer and documentary filmmaker Tracy Sorensen, another Big Skies Collaborator [more>>], visited the dome-covered BiSON spectrometer at the Paul Wild Observatory near Narrabri in August, to research a new space-themed literary work. The Narrabri instrument is one of six heliospectrometers in the University of Birmingham’s Solar-Oscillations Network (BiSON) to monitor the inner rumblings of Earth’s Sun. Another BISON spectrograph is located on the site of the OTC Satellite Earth Station in Carnarvon, Western Australia, near the old Carnarvon Tracking Station, which was so important to NASA’s space missions in the 1960s. Tracy grew up in Carnarvon so knows these installations well. Indeed, she set her recent novel, The Lucky Galah (Picador, 2018), in a fictional town very much like Carnarvon in the 1960s. Tracy is now reflecting on the way researchers are using data from the Sun, as recorded at the Paul Wild Observatory and Carnarvon, in her Big Skies essay. We’ll let you know when and where it’s published. Yes, another literary work by another Big Skies Collaborator. Me! I’ve tentatively called this project Skycountry: a cosmography, but am using the term cosmography rather loosely as I investigate some of the ways people have been experiencing the sky from within our 700KA region over the past 60,000+ years. In more recent times, migrants from every inhabited continent of our planet have gazed at the stars and other celestial objects through many different lenses, including ‘Western’, Persian, Arab and Chinese cosmologies. This diversity is often overlooked, but not everywhere. 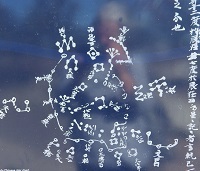 At the Paul Wild Observatory, for example, the famous Dunhuang Star map is etched into a sheet of bronze, as shown in the photo! I was thrilled to find it. 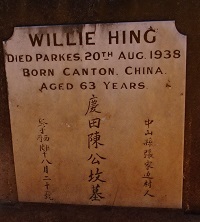 As part of my ethnographic research for my book, I spent Lunar New Year 2018 in Guangzhou, or old Canton, and travelled around China’s Greater Pearl River Delta region to learn about the lives of Cantonese people who sailed to Australia in the C19th. I’m now planning my next trip to China to visit the Beijing Ancient Observatory and the Taosi observatory site in Shanxi Province, which dates to c. 2300 BCE. I’ll probably make a third trip to see some of China’s C21st observatories, including FAST (the Five-hundred-meter Aperture Spherical radio Telescope) in Guizhou Province. I’d also like to meet some of the Chinese astronomers who are using remotely operated telescopes located in our 700KA region. Skycountry: a cosmography is a mega-project. It’ll take years to complete. I just hope I’m up to the challenge! I feel very privileged to be able to visit China to learn more about its astronomical heritage, and to work with Wiradjuri and other First Nations people to understand a little more about their cosmologies. But how much better would it be if writers who have themselves inherited these and other traditions would submit their own skystories to our Skywriters Anthology? So please help us ensure that this first anthology reflects the true diversity of the people who have gazed in wonder at our southern sky from southeastern Australia’s rural inland. My thanks for your support and interest in our Big Skies Collaboration.